Reserve Bank of India and the Tinbergen rule: Please end the stop-go policies! Indian (SENSEX) stocks climbed for the first time in four days, led by the biggest rally in financial shares since 2009, after the central bank said it will buy government bonds to combat surging borrowing costs. The Reserve Bank of India on July 22 made it mandatory for importers to set aside 20 percent for re-exports as jewelry. The measures to moderate demand boosted the premium that jewelers pay to importers to about $10 an ounce over the London spot price from as low as $4 a week earlier, according to the the All India Gems & Jewelry Trade Federation. Hence, RBI stepped in to curb the buying of gold by Indians to stop the sell-off in the rupee. That of course was monetary tightening. It is about time that somebody reminds the RBI about the Tinbergen Rule: For each and every policy target there must be at least one policy tool. If there are fewer tools than targets, then some policy goals will not be achieved. The only thing RBI fundamentally can do is to control the money base to hit one nominal target. Therefore, it is also about time that RBI comes clean on this. RBI can only hit one target (with one instrument). That target in my view should be a nominal gross domestic product (GDP) target, but the most important thing now is that RBI just announces one nominal target—be it an inflation target, a price level target or a nominal GDP target. RBI should immediately end the attempts to distort financial prices—whether in the fixed income or the currency market. Leave it to the markets to determine the prices in the fixed income markets and the currency markets. If RBI is concerned about the heightened volatility in the Indian financial markets it should at least stop creating volatility on its own. The best way of doing this of course is to announce a clear rule-based monetary policy. There is only so much monetary policy can do. Monetary policy is extremely effective when it comes to hitting a nominal target, but monetary policy cannot do much about India’s other problems—for example the major public finance problems. The Indian government has to take care of that problem. PS One can of course fear that RBI will not give up on trying to hit more than one target. Then it, however, will need more policy instruments. Normally this would be capital and currency controls. God forbid the RBI will venture down that road. This post has also been publlished at livemint.com. Asian stocks fell for a fourth day after U.S. Treasury yields reached a two-year high. Currencies from Malaysia to Thailand declined amid an emerging market exodus that’s seen investors withdraw $8.4 billion from exchange-traded funds this year. …Indonesia’s Jakarta Composite Index dropped 3 percent, taking a four-day rout beyond 10 percent…Malaysia’s ringgit decreased for a seventh day, and the Thai baht fell 0.8 percent. …Asian economies are struggling to ignite growth. …Five stocks fell for every three that gained on the Asia-Pacific index. Real estate and construction firms led declines in Jakarta where the benchmark index tumbled as much as 20 percent from a high in May. …China’s economy, No. 2 in the world, has been slowing for the past two quarters. Indonesian shares led declines in emerging Asian markets yesterday, sliding 5.6 percent, after data showed the current-account deficit widened to a record last quarter. A report this month also showed the economy grew less than 6 percent for the first time since 2010 in the second quarter. …Foreigners sold a net $3 billion of Indian stocks and bonds in July amid the slowest growth in a decade in Asia’s third-largest economy, according to data compiled by Bloomberg. The rupee slid to a record low yesterday and 30-day volatility on the CNX Nifty Index touched the highest level since April 2012. …Thailand’s SET Index dropped 3.3 percent yesterday, the most in two months, after a report showed the economy unexpectedly shrank in the second quarter, pushing the country into a recession. The government also cut its growth forecast. It is hard to feel optimistic about growth in Asia when you read this kind of thing. In the article the market turmoil is blamed in Fed “tapering”, but I would suggest that Chinese monetary tightening is at least as important. Hence, China is as I have argued earlier the monetary superpower of Asia and Chinese monetary tightening weigh heavily on the Emerging Asian currencies. If the “local” central banks try to fight the currency sell-off then they are automatically importing monetary tightening from China causing growth to slump. The slump in the local stock markets is an indication that this is in fact what is partly happening. The good news is that we are in fact seeing currencies weaken across Asia – that is softening the blow from the “China shock” . The bad news is that Asian central banks in general has been fighting the currency sell-off by hiking interest rates, intervening in the FX markets and by introducing all kinds of draconian currency controls. All that is likely hit growth across the region. And yes, I am quite nervous about new cases of monetary policy failure, where local policy makers in their attempts to curb the currency sell-off end up doing more bad than good. Just take a look at stop-go policies of Bank Indonesia and the Reserve Bank of India over the past two months. The best way to shield the Asian economies from the negative impact of Chinese monetary tightening and fed tapering is to let currencies float completely freely and to the extent necessary letting the currencies weakening. Trying to fight the currency sell-off with monetary tightening is the recipe for setting of the Second Asian Crisis. As long as the impact of the Chinese monetary tightening continues Asian policy makers have the choice between weaker currencies or lower growth. You cannot have both in the present situation. Only a couple of days ago I was complaining that the Turkish (and the Polish) central bank(s) have been intervening in the currency markets. My complains of the Turkish central bank’s fear-of-floating and what seemed to be politically motivated monetary operations were then followed by the Brazilian central bank that hiked interest rates – officially to curb inflationary pressures, but what to me very much looked like an effort to prop up the Brazilian real. “The Reserve Bank of India (RBI) announced measures late on Monday to curb the rupee’s decline by tightening liquidity and making it costlier for banks to access funds from the central bank. The RBI raised the Marginal Standing Facility (MSF) rate and Bank Rate each by 200 basis points to 10.25 percent, capped the amount up to which banks can borrow or lend under its daily liquidity window and announced a sale of government securities through an open market operation. The RBI said total funds available under its repo window will be capped at 1 percent of banks’ deposits – roughly 750 billion rupees – from Wednesday. It announced a 120 billion rupee sale of government bonds for Thursday. It is very hard to be impressed by the RBI’s de facto currency targeting as there is hardly any economic arguments for the RBI’s actions, but we can safely conclude whatever motivated the RBI have just implemented significant monetary tightening. I have earlier argued that there might be arguments for tightening monetary policy in India. 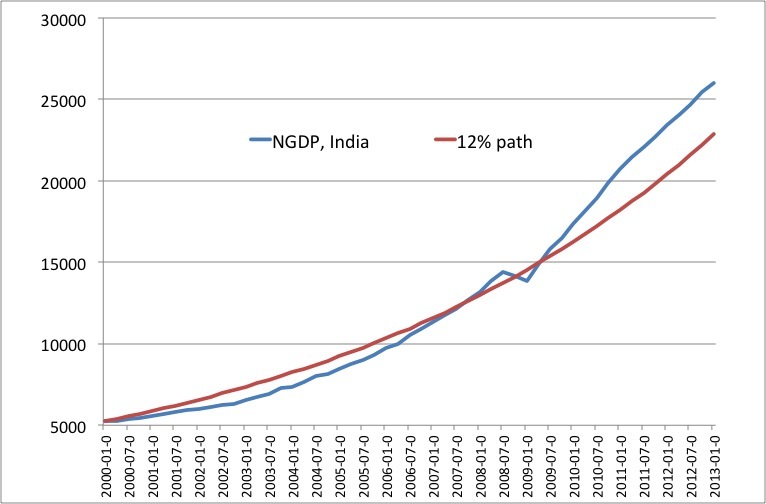 Hence, since 2009 nominal GDP has risen much sharper than the earlier NGDP-trend of around 12% NGDP growth. The graph below illustrates this. 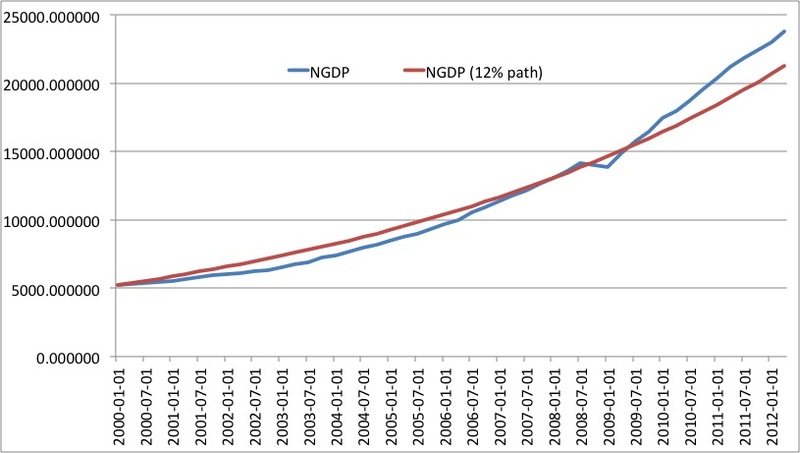 Furthermore, there is there is nothing “optimal” about a 12% NGDP growth path. In fact I believe that the RBI if anything rather should target an NGDP growth path around 7-8% (as I have argued earlier). The problem with the RBI’s recent actions is not necessarily the decision to tighten monetary policy per se, but rather the in fashion it is done. The RBI’s decision has clearly not been based on a transparent and rule based monetary framework. Hence, after years of high NGDP growth and high inflation the RBI suddenly slams the brakes. And mind you not to hit an NGDP level target or an inflation target for that matter, but to “stabilize” the currency. The result of this currency “stabilization” might be that the RBI will be able to curb the sell-off in the rupee (I doubt it), but we can be pretty sure that the cost of this “operation” will likely be a fairly sharp slowdown in Indian real (and nominal) GDP growth. You have to choose – either you have a “stable” currency or stable macroeconomic conditions. I fear that the RBI has just sacrificed macroeconomic stability in a ill-fated attempt to stabilize the currency – at least if the RBI insist to continue the policy of FX intervention. In a sense the RBI has been pursuing both too easy monetary policies – too high NGDP growth and inflation – and at the same time too tight monetary policy in the sense of an abrupt monetary contraction to prop up the rupee. This is the core of the problem – the RBI’s counterproductive stop-go policies. In my view the RBI urgently needs give up its policy of fiddling with the currency and instead let the rupee float completely freely and instead announce an target on the nominal GDP level. In my view the historical trend of 12% NGDP growth is too high and a lower NGDP growth target of 8% seems to be more appropriate. The RBI should hence announce that it gradually will slow NGDP growth to 8% over a five period. It is important that this should be a level target. Hence, if growth is faster than 11% in 2014 then it is important that NGDP growth will have to be even slower in the next four years. That is exactly the idea with a level target – you should not allow bygones-to-be-bygones. After 2018 the RBI will keep NGDP on 8% growth path. Such a policy will ensure a lot more nominal stability than historically has been the case and therefore also very likely significantly increase macroeconomic stability. Furthermore, a side effect will that the rupee likely will be more stable and predictable than under the present stop-go regime as FX volatility to a very large extent tend to be a result of monetary disorder. “For more than 100 years across the 19th and 20th centuries, its gnomic messages, worked into Morse code and out into language again, then delivered by postmen, connected human beings in faraway places. It announced births, marriages and deaths; called soldiers home from war or announced their demises to their families (or changed the course of the war itself); confirmed job offers or remittances to anxious and impatient souls. The voice of history whenever it was in haste, it was stoic by nature — concealing waves of emotion under its impassive, attenuated syntax — and easily available to rich and poor, in city and village. In India, it was installed by the British as a way of administratively and militarily linking up the vast reaches of the subcontinent. But it became one of the engines of the freedom movement, a way for the Indian migrant to keep up a tenuous link to the world he had left far behind. The Indian word for it was “taar,” or wire, invoking an image more concrete than the English “telegraph.” (The “wire,” in English, was claimed by news media services.) Long after the rest of the world had moved on to more advanced technologies, the humble telegraph continued to enjoy great currency in India, before the onset of the digital revolution began to chip away at its hegemony. But the end has been in sight for some years now. With the explosion of the mobile-phone revolution in the last decade (described recently in “The Great Indian Phone Book“), the telegraph service began for the first time to appear anachronistic. Text messages sent from mobile phones began to make the taar service seem quaint, even to rural users. This weekend, Bharat Sanchar Nigam Ltd, the state-run company that runs the system, is finally set to wind down its telegraph service for good, just as Western Union decided in 2006 that it was over for its telegrams in the U.S. Almost 16 decades after a member of the Indian public sent a telegram for the first time in 1855, the telegram will finally give up the ghost in one of its last surviving redoubts. The Indian telegraph service still processes about 5,000 telegrams each day (most of them government notifications). It is truly bizarre that a developing country like India until this day has continued to have a government run telegraph company, but I think it tells you a lot about how extreme the level of government intervention in the Indian economy still is. In the 1990s growth was kick-started by a number of supply side reforms. However, over the past decade speed of reforms have been much more slower and in some area reforms have even been scaled back. In this regard it should be noted that inflation has been stubbornly high – around 7-8% (GDP deflator) – since 2009. But at the same nominal GDP growth has slowed. This to me is an indication that while monetary policy has indeed become tighter India has also at the same time seen a deterioration of supply side conditions. The result has been a fairly sharp slowdown in real GDP growth in the same period. I think it is quite unclear what is potential real GDP growth in India, but I think it likely is closer to 5-6% than to 8-10%. This would seems to be a quite low trend-growth given the low level of GDP/capita in India and India’s trend-growth seems to be somewhat lower than that of China. Concluding, while a monetary regime change certainly is needed in India serious structural reforms are certainly also needed. The best place to start would be to get rid of India’s insanely high trade tariffs and generally opening up the economy significantly. Update: s shorter edition of this blog post has also been published at financeasia.com. See here.